Introduction: The aim of the present study was to calculate the prevalence of chromosomal abnormalities among antenatally diagnosed congenital heart diseases (CHDs), and the prevalence of 22q11.2 deletion in those with conotruncal CHDs versus isolated non-conotruncal CHDs. Methods: All patients with antenatal ultrasound finding of fetal CHDs in two obstetric units in a 5-year period were retrospectively reviewed. Detected CHDs were classified as conotruncal if the malformation involved either the aortic outflow tract or the pulmonary outflow tract; otherwise they were classified as non-conotruncal. Karyotyping, fluorescence in situ hybridisation for 22q11.2 deletion (22q11FISH), and array comparative genomic hybridisation (aCGH) results were retrieved from patient medical records. The primary outcome was prevalence of chromosomal abnormalities in CHDs. The secondary outcomes were prevalence of 22q11.2 deletion and its prevalence in conotruncal versus non-conotruncal CHDs. Results: A total of 254 Chinese patients were diagnosed to have fetal CHDs. In all, 50 (19.7%) were found to have chromosomal abnormalities with seven (2.8%) patients having 22q11.2 deletion, of whom all seven had conotruncal CHDs and none had non-conotruncal CHDs (P<0.05). Conventional karyotyping detected 35 (70%) cases of the chromosomal abnormalities. The 22q11FISH detected three cases of 22q11.2 deletion; aCGH was performed to detect four cases of 22q11.2 deletion and eight other cases of copy number variations. Conclusion: Our results suggest that invasive testing for karyotyping is recommended for fetal CHDs. Although the prevalence of 22q11.2 deletion was low, testing for 22q11.2 deletion should be offered for conotruncal CHDs. Prevalence of 22q11.2 deletion in the Chinese population is low. 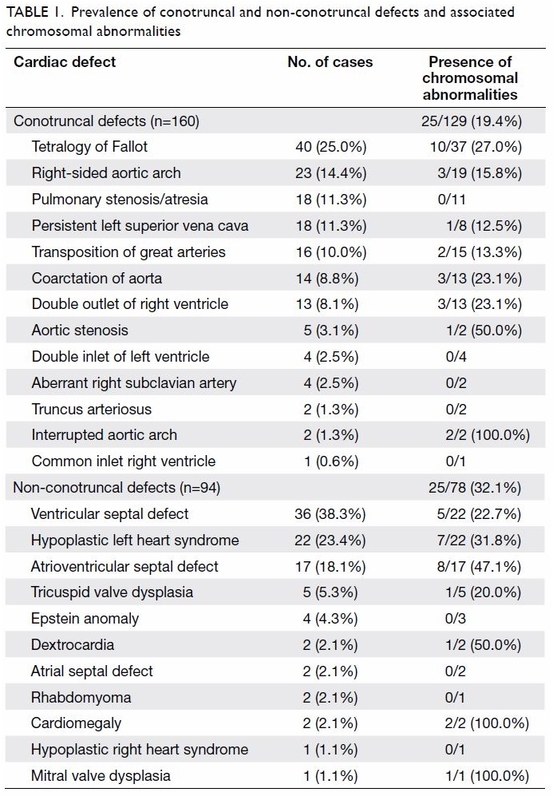 Cardiac abnormalities in 22q11.2 deletion are mainly conotruncal cardiac defects. Patients should receive counselling for invasive testing for chromosomal abnormalities in fetal cardiac lesions. Testing for 22q11.2 deletion is recommended for conotruncal cardiac defect. Congenital heart diseases (CHDs) are the commonest congenital malformations at birth and a leading cause of neonatal mortality, with an incidence of around eight in 1000 births.1 The reported incidence of chromosomal abnormalities in patients with CHDs differs between infants and fetuses, as well as among different series and studies, ranging from 9% to 18%.2 3 4 5 6 7 Many previous studies have typically only included major aneuploidies as chromosomal abnormalities; other chromosomal aberrations, such as 22q11.2 deletion or other microdeletions, were not investigated. The availability of new cytogenetic and molecular technologies, such as specific fluorescence in situ hybridisation (FISH) probes, array comparative genomic hybridisation (aCGH),8 or sophisticated genome sequencing methods,9 10 has increased the identified contribution of chromosomal abnormalities. The objective of this study was to calculate the prevalence of chromosomal abnormalities among antenatally diagnosed CHDs, and the prevalence of 22q11.2 deletion in those with conotruncal CHDs versus isolated non-conotruncal CHDs. The aCGH, 22q11FISH, and karyotyping results were reviewed from patient medical records. The prevalence of chromosomal abnormalities in these antenatally diagnosed CHDs fetuses, specifically the prevalence of 22q11.2 deletion, was calculated and compared between the conotruncal CHDs and the non-conotruncal CHDs. The primary outcome was the prevalence of chromosomal abnormalities in CHDs. The secondary outcomes were the total prevalence of 22q11.2 deletion in conotruncal CHDs compared with that in non-conotruncal CHDs. The SPSS (Windows version 20.0; IBM Corp, Armonk [NY], US) was used for data entry and analysis. Comparison of categorical variables between the conotruncal and non-conotruncal groups was analysed by Chi squared test or Fisher exact test where appropriate. A P value of <0.05 was considered statistically significant. From July 2012 to June 2017, there were 54 802 deliveries in United Christian Hospital and Prince of Wales Hospital, among which 264 (0.48%) patients were diagnosed to have fetal CHDs by antenatal ultrasound scan. Of these, 254 (96.2%) patients were Chinese and were recruited for final analysis. The mean (± standard deviation) maternal age was 32.3 ± 4.9 years, with 151 (59.4%) patients being nulliparous. The mean gestational age at diagnosis of fetal CHDs by ultrasound was 20.4 ± 2.9 weeks. Within the total cohort of 254 patients with fetal CHDs, 160 (63.0%) were classified into the conotruncal group, while 94 (37.0%) were classified into the non-conotruncal group. The prevalence of the various types of conotruncal and non-conotruncal CHDs and the prevalence of chromosomal abnormalities are listed in Table 1. Fourty-one (16.1%) patients had other structural abnormalities found in antenatal ultrasound apart from CHDs. Chromosomal analysis and karyotyping was done in 207 (81.5%) patients; of them, aCGH was performed in 146 (70.5%) and 22q11FISH was performed in 61 (29.5%). The remaining 47 patients refused chromosomal analysis. In the group of 207 fetuses with karyotype performed, 50 (24.2%) were found to have chromosomal abnormalities; trisomy 21 and trisomy 18 accounted for 42.0% of all these abnormalities. The different types of chromosomal abnormalities are shown in Table 2. Of the 50 cases with chromosomal abnormalities, 35 (70%) were detected by conventional karyotyping. Three cases of 22q11.2 deletion were detected by FISH; aCGH detected another four cases of 22q11.2 deletion and eight cases of other CNVs, as shown in Table 3. The prevalence of chromosomal abnormalities in fetuses without extracardiac abnormalities was 29 of 168 (17.3%), whereas that in fetuses with extracardiac abnormalities was 21 of 39 (53.8%). The prevalence of chromosomal abnormalities in non-conotruncal CHDs was 25 of 78 (32.1%) which was significantly higher than that in conotruncal CHDs (25 of 129; 19.4%) [P=0.04]. All seven patients with 22q11.2 deletion were found in the group of conotruncal CHDs and no patients with 22q11.2 deletion were found in the group of non-conotruncal CHDs (P<0.05). The details of these seven cases are shown in Table 4. Among the whole cohort of 254 patients with prenatal ultrasound diagnosis of CHDs, 101 (39.8%) patients had their pregnancies terminated. There were 134 (52.8%) live births, nine (3.5%) neonatal deaths, and four (1.6%) intrauterine deaths or miscarriages. Six (2.4%) patients were lost for followup and could not be contacted for their pregnancy outcomes. The data from this cohort demonstrated that 24.2% of fetuses with CHDs detected by antenatal ultrasound were found to have chromosomal abnormalities. The frequency of chromosomal abnormality in fetuses with CHDs is much higher than the frequency of such abnormalities in infants, because a large portion of these fetuses are terminated. A 2004 review found that up to 33% of fetal CHDs were associated with chromosomal abnormalities1; this is much higher than the prevalence in our cohort for two reasons. Firstly, subtle defects such as right-sided aortic arch, persistent left superior vena cava, and aberrant right subclavian artery were not included as CHDs in the previous review. With advances in the ultrasonography resolution, these subtle defects are detected with increasing frequency in recent years. In the current cohort, up to 45 cases belong in this category, but only four of them were found to have chromosomal abnormalities. Secondly, most of our patients had combined biochemical screening or cell-free DNA test in the first trimester for Down syndrome screening. If the screening test was positive, an invasive test was performed and management offered accordingly. Fetal CHDs may not be detectable at that early gestation, and obstetricians may not have been focused on detecting cardiac abnormalities at that time. Therefore, the true prevalence of chromosomal abnormalities in CHDs in fetuses with common aneuploidies may be underestimated in our cohort. In the present study, non-conotruncal CHDs were found to have a higher prevalence of chromosomal abnormalities than conotruncal CHDs. Some types of CHDs, such as atrioventricular septal defects and hypoplastic left heart syndrome, are associated with a higher prevalence of chromosomal abnormalities than others, whereas some types of CHDs, such as truncus arteriosus, are rarely associated with chromosomal abnormalities. Invasive testing for karyotyping is generally recommended for antenatally diagnosed CHDs, as the prevalence of chromosomal abnormalities is up to 24.2%. Non-invasive prenatal testing may be performed instead of karyotyping for some isolated cardiac abnormalities, such as isolated small ventricular septal defects (VSDs), persistent left superior vena cava, and aberrant right subclavian artery, when the purpose is to exclude major aneuploidies such as trisomy 21. The 22q11.2 deletion syndrome is also called DiGeorge syndrome or velo-cardio-facial syndrome. Most patients with this syndrome have a 1.5- to 3-Mb hemizygous deletion at chromosome 22q11.2 causing TBX1, CRKL, and MAPK1 gene haploinsufficiency.18 This syndrome is characterised by cardiac defects, cleft palate, thymic hypoplasia, immune deficiency, hypocalcaemia, and learning difficulties.19 It has more than 180 associated phenotypic features, with very variable genotype-phenotype correlations. Congenital heart diseases remain one of the most important clinical manifestations, and are present in 75% of patients with 22q11.2 deletion.19 The most common abnormalities are conotruncal CHDs, among which tetralogy of Fallot (TOF) is the most common.14 20 However, 22q11.2 deletion has also been reported in patients with non-conotruncal CHDs such as isolated VSD.13 14 In a cross-sectional survey of 392 patients with CHDs, the prevalence of 22q11.2 deletion was only 1.27%. Four out of the five confirmed patients had conotruncal CHDs (interrupted aortic arch, truncus arteriosus, and TOF); the other patient had non-conotruncal CHDs (VSD plus atrial septal defect). Two patients had congenital extracardiac anomaly (one with arched palate and micrognathia and one with hypertelorism).21 In a survey of 125 consecutive children in South Africa with CHDs, the prevalence of 22q11.2 deletions was 4.8%. The cardiac abnormalities in these confirmed patients included four with conotruncal CHDs (tricuspid atresia with interrupted aortic arch, tricuspid atresia with right-sided aortic arch, TOF, and VSD with right-sided aortic arch), but also two isolated VSDs.22 The above two studies suggest that most patients with 22q11.2 deletions have conotruncal CHDs; although non-conotruncal CHDs are possible, the prevalence is low. 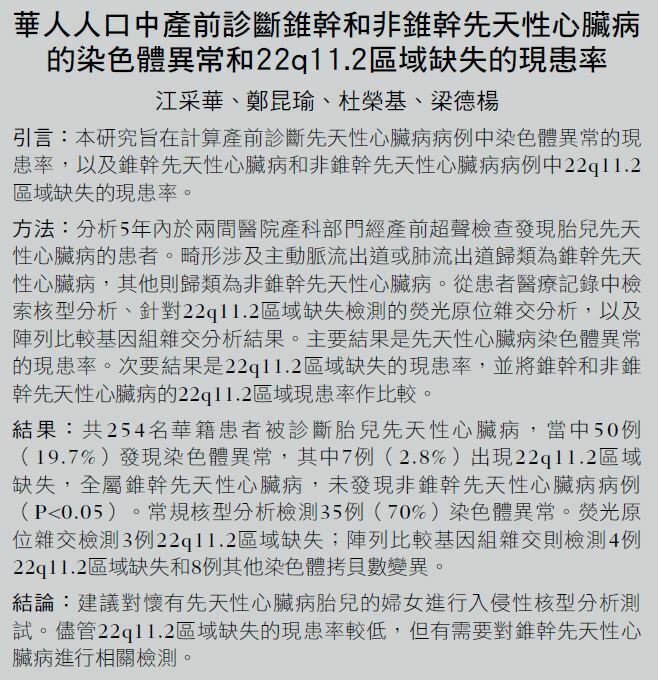 In contrast, in a small Chinese series, the frequency of 22q11.2 deletion in three Chinese ethnic groups (Tai, Bai, and Han people) with 19 sporadic CHDs was studied using genotype and haplotype analysis with D22S420 in 11 consecutive polymorphic microsatellite markers. Within this cohort, deletions at D22S944 were found in two of four patients with TOF, one of five patients with VSD, and one of five patients with patent ductus arteriosus. Those authors concluded that sporadic 22q11.2 deletion could be detected in isolated TOF, VSD, and patent ductus arteriosus in Chinese ethnic groups without relevant family history of CHDs.13 The present study includes a larger sample size (207 fetuses) than the previous two Chinese studies, but the detected prevalence of 22q11.2 deletion was only 3.4%. In addition, all seven fetuses with confirmed 22q11.2 deletion in the present study had conotruncal CHDs; none had non-conotruncal CHDs or isolated VSD. The inclusion of patent ductus arteriosus in the second study as CHDs is inconsistent with other studies. Therefore those findings of 22q11.2 deletion associated with isolated CHDs should be further evaluated in other populations. The prevalence of 22q11.2 deletion in the present study was 3.4% (7/207), which is comparable to that reported in the literature. Because all patients had either 22q11FISH or aCGH testing, the possibility of underdiagnosis was minimised. The cardiac abnormalities identified in the confirmed cases were all conotruncal CHDs typical of 22q11.2 deletion syndrome. The deletions were not found in any cases with non-conotruncal CHDs, suggesting that the occurrence of 22q11.2 deletion in non-conotruncal CHDs in the local population is very low. Array comparative genomic hybridisation is a molecular cytogenetic technique to detect any CNVs within the genome. A systematic review and meta-analysis on the use of aCGH on fetal CHDs that included 1131 cases showed that the incremental yield of aCGH in detecting CNVs after karyotyping and 22q11FISH analysis was 7%. An incremental yield of 12% was found when 22q11.2 deletion cases were included.24 In the present study, aCGH detected four cases of 22q11.2 deletion and eight additional cases of CNVs. On the basis of the deletion size in the four cases of 22q11.2 deletion, three should also be detected by 22q11FISH; only the 61-kb deletion would not be detectable by FISH. Therefore, if all patients in our cohort had karyotyping only without 22q11FISH, aCGH would have an incremental yield of 6.0% (12/207). If all our patients had karyotyping and 22q11FISH as first line, then aCGH would have a further incremental yield of 4.3% (9/207). This incremental rate for aCGH was lower than that reported previously.24 For patients in Hong Kong, aCGH is a self-financed option. If fetal CHDs are detected antenatally, invasive testing with karyotype and aCGH is offered to the patient on the basis of the potential incremental yield of aCGH. In the present study, counselling for patients whose fetus has Williams-Beuren syndrome or Phelan-McDermid syndrome would be different from that for patients whose fetus has isolated cardiac defects, as there would be other extracardiac manifestation such as mental retardation. However, if patient declines self-paid aCGH, 22q11FISH should be offered in addition to conventional karyotyping, because karyotyping cannot readily detect 22q11.2 deletion. This study may have underestimated the prevalence of chromosomal abnormalities, because 47 of our patients did not have chromosomal analysis performed, 30 of whom were counselled as having minor cardiac abnormalities or were normal variants (14 fetuses had isolated small VSD, 10 had persistent left superior vena cava, four had right-sided aortic arch, and two had aberrant right subclavian artery). However, none of the babies were suspected or diagnosed to have chromosomal abnormalities or DiGeorge syndrome after clinical assessment by paediatrician after birth. Therefore, we assumed that there were no major clinically significant chromosomal abnormalities in these babies. Although the prevalence of 22q11.2 deletion is low, testing for 22q11.2 deletion should be offered for fetuses with conotruncal CHDs. Array comparative genomic hybridisation has an additional incremental yield of around 5% on other microdeletions apart from 22q11.2 deletion, and should be offered in addition to karyotyping and 22q11FISH. All authors had full access to the data, contributed to the study, approved the final version for publication, and take responsibility for its accuracy and integrity. Concept or design of the study: CW Kong, WWK To. Acquisition of data: CW Kong, YKY Cheng. Analysis or interpretation of data: CW Kong, YKY Cheng, WWK To, TY Leung. Drafting of the manuscript: CW Kong. Critical revision for important intellectual content: YKY Cheng, WWK To, TY Leung. The findings of this study were presented as poster presentation in the 17th World Congress in Fetal Medicine, Athens, Greece, 24-28 June 2018. Ethics approval for this study was granted by the Kowloon Central/ Kowloon East Research Ethics Committee (KC/KE-17-0183/ER-3) and the Joint CUHK-NTEC Clinical Research Ethics Committee (NTEC-2017-0336). As this study was a retrospective review, the need for individual patient consent was waived by the above two research ethics committees. 19. Digilio M, Marino B, Capolino R, Dallapiccola B. Clinical manifestations of Deletion 22q11.2 syndrome (DiGeorge/Velo-Cardio-Facial syndrome). Images Paediatr Cardiol 2005;7:23-34. 23. Lv W, Wang S. Detection of chromosomal abnormalities and the 22q11 microdeletion in fetuses with congenital heart defects. Mol Med Rep 2014;10:2465-70.